At Custom Fibre Optics we use our imaginative skills to incorporate fibre optic and LED designs into the wedding and events scene. We do what we do best, which is to create eye catching products with a real WOW factor. We offer a fully insured delivery, set up and collection service in and around the North East UK. If you’re looking for something special and unique for your event then we can help. We can supply you with bespoke venue lighting features like no one else can. Fortunately for us, we don’t have to copy the trends and buy in our products and compete with other companies, we design and manufacture them ourselves. This means you’re hiring an exclusive product, tailored if you wish. See our range of products below, however we do have a lot more designs available and will have many more awe-inspiring lighting features to follow. Please don’t hesitate to enquire about any of our products or services, we have a great team of helpful, friendly and experienced staff who will be happy to hear from you. If there is something you’re looking for but it isn’t listed, just ask, we have lots of exciting new products and features coming soon. 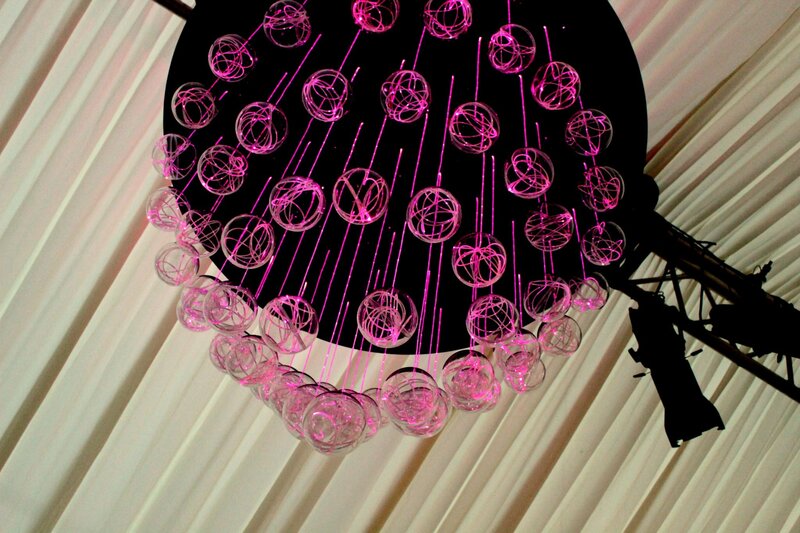 Brand new to the wedding scene are our fibre optic and LED chandeliers now available to hire. 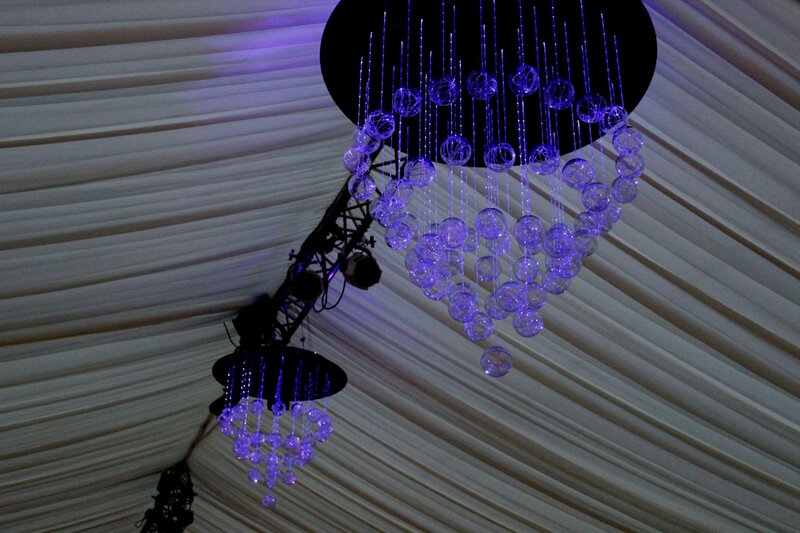 We can install suspended chandeliers to buildings and marquees and also have free standing, telescopic chandeliers which can go in any venue, indoors and out. Our chandeliers come in a stunning range of shapes and sizes and are completely customisable. We are currently working on new designs and will continue do to this to keep inspiring our clients and their guests with an amazing centre lighting feature. When the lights go down our chandeliers are a thing of beauty, with colour changing and twinkling light, they can be as subtle or as vibrant as you like. We can programme our chandeliers specifically to your requirements. 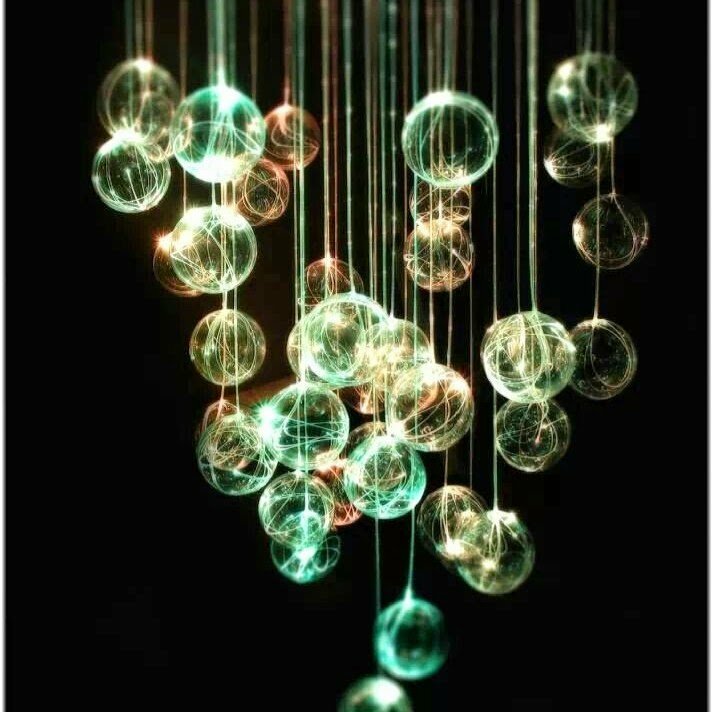 Not only can you control the colour and effects of the light but you can also design your own chandelier with different drop lengths, add crystals, acrylic shapes and decoration to suit your scene. We want you to have the perfect feature at your event and one that’s personal to you and different from the rest so were happy to customise and adapt our products to meet your needs. Please get in touch for more information on our chandeliers. Looking to make your event bigger and better than the rest? 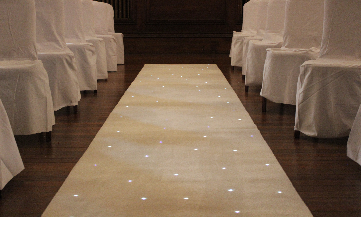 Then why not hire one of our amazing luxury aisle carpets which are studded with tiny twinkling fibre optic stars. Our beautiful starry carpet makes any event look special and adds true elegance and a real wow factor. Apart from the gorgeous Ivory carpet shown we have a range of colours available such as red, black, midnight blue and white. As always we don’t just stop there with a few stock colours. For a premium we are happy to customise our carpets to make them unique to you and your event. You can tell us how many lights you’d like and also where you’d like the lights to be. For example you could have a line of evenly spaced lights up each side, a Mr and Mrs design, scattered heart shapes and any kind of patterns you wish. Be one of the first, showing your style, use your imagination and take a great opportunity to show off at your event with a very unique product which is brand new to the market. The stars can be set up and programmed especially for you and your event with colour selection and twinkle speed. This means you could have a vibrant flashing colour change for a party, or a warm white colour with a slow twinkle for a wedding and everything in between. 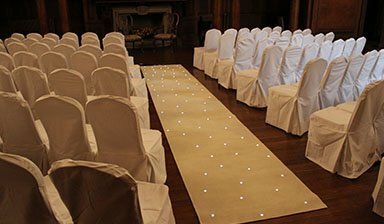 You can set the carpet lights to a specific colour to match your decor and then you can add a twinkle at a speed you wish, so you get a completely customisable carpet to stop people in their tracks and have everyone talking at your event. 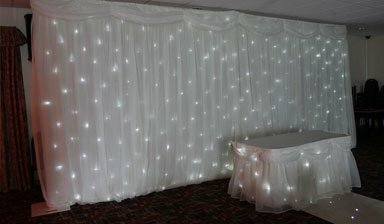 This is an example of our stunning backdrop and table skirts which are scattered with dozens of soft twinkling fibre optic lights, not to be confused with inferior LED backdrops which only flash bright white light. They are of the highest quality on the market and can transform the look of any room. We can programme the lighting to your own preference, you can choose from several static colours, you can choose to add a twinkle effect at a speed you like best and you also have colour changing options too. 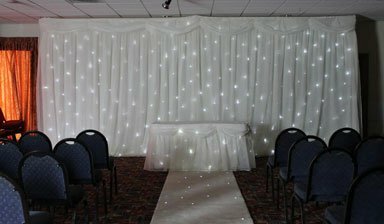 So for a stunning backdrop at a wedding ceremony you could have white stars with a slow twinkle, or at a party you could have a bright and colourful twinkling light show. Coloured swags and voiles could also be used to add a personal touch, and we also hire out LED RGB up lighters which add dramatic colour washing effects. The backdrop and tableskirt use an efficient, cool running, PAT certified LED light source which uses a standard UK socket.